Squirrel, the most majestic creature I have ever known, is not doing so good. We found out today from the vet that he’s in renal failure and his days are numbered. Words cannot express what Squirrel means to me. 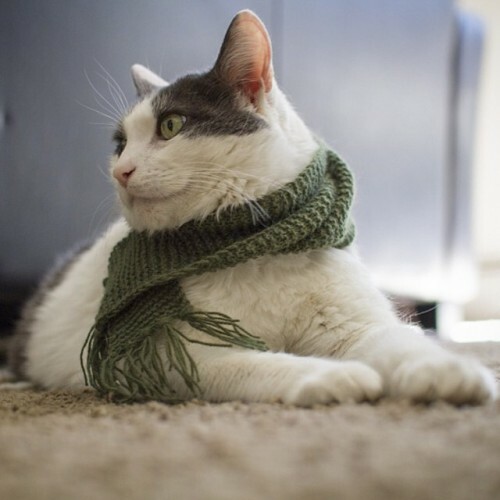 Squirrel is the inspiration behind CatScarf, and everything else I do. He motivates me with his side glances and judging eyes, comforts me with his slow blinks and head nudges, and inspires me every time he makes the jump from our couch to our countertop, which is at least a 7ft gap. Squirrel didn’t just teach me how to love, he taught me how to love cats. Before him I was a dog person. I am forever changed. I am a Squirrel person now and forever. Here’s to hoping his last few months are the best he’s ever had.